101 "He was admitted sizar at Peterhouse College, Cambridge, 2 Jul 1625, and took the degree of Bachelor of Arts in 1628/9. 104 "He was reared on the farm and attended the district school until 18 years of age and later spent two winters in attendance at the Chamberlin Institute at Randolph, NY. For a number of years he followed the carpenter trade and in April 1875, came to Crawford county, first settling at Westside. 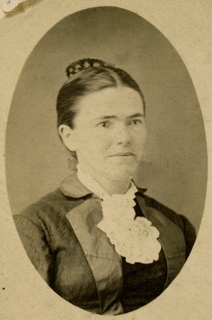 "On April 3, 1879, he was united in marriage to Miss Lucy Ann Lyman, the wedding ceremony being performed at the home of her sister in Logan. The couple soon moved to a farm between Westside and VAil and it was here that their three children were born, Lyman Bowen of Warm Springs, Mont., and Mildred and Alfred, both at home. 105 "He [John Scott] served as a Lieutenant and Commissry at Pennsylvania General Hospital in the Revolutionary War. John Scott is the same ancestor under whom Mrs. Caroline Scott Harrison (wife of President Harrison, ex-Presidnet of United States) entered the N.S.D.A.R." 119 "I know nothing of Thomas Wight's arrival in New England, or his history there previous to the winter of 1635-6, at which time he seems to have been in Watertown. Over a year later he appears tangibly in Dedham. 'The 18th of ye 5th month, commonly called July 1637' Thomas Wight with eleven other persons, having been duly certified by the magistrates, and having subscribed unto the covenant, was admitted an inhabitant of Dedham. At this time his family consisted of his wife Alice or Elsie, and children Henry, John, Thomas and, doubtless, Mary. In the distribution of lands for homesteads, Thomas Wight received from the town the portion, twelve acres, allotted to each married man. 126 "In late 1738, Caleb married Mary Warren, widow of Ebenezer Warren. They were married by Rev. Samuel Dunbar. David, the NEHGS staff member, suggested that I look at Rev. DunbarÙus handwritten church records from the Parish Church in Stoughton. He glanced through them briefly and discovered that Caleb and Mary Smith had agreed to live separately and apart from one another 6 months after their marriage. The records stated that they could not live amicably with one another, and since there had been no instance of fornication, the church elders lamented their separation as a violation of ChristÙus command in Matthew 19:9. Anyway, further research is needed to determine what happened to Caleb, Sr. He was alive through 1747, but I have found no reference to him after that date. He does not appear in vital records or probate records so IÙull take a look at the Parish Records myself. (Even though Caleb and Mary might have separately permanently, their lives must have remained linked since CalebÙus daughter, Rachel Smith, married MaryÙus son, Benjamin Warren, only a few weeks after their parents married one another!)" 128 "In the absence of any record as to when Edmond Tilson and wife Joane left England, or arrived in New England, we can only form conclusions from the first records at Plymouth, Mass., when he applied to the court, Sept. 3, 1638, for land at Woeberry Plaine, and same year on Oct 1, the court granted him five acres. He was many time on the Jury, evidently a capable person . . . . His residence was at Plymouth, where he died Oct 25, 1660." 129 "In the absence of any record as to when Edmond Tilson and wife Joane left England, or arrived in New England, we can only form conclusions from the first records at Plymouth, Mass., when he applied to the court, Sept. 3, 1638, for land at Woeberry Plaine, and same year on Oct 1, the court granted him five acres." 134 "Is James [Michael] the son of Rev. David Ross, George Ross's eldest, and Sarah Rolfe? Perhaps it is so, but not one record, E.G. a baptismal, has surfaced." 137 "It was in 1743 that Joshua accompanied his father-in-law to North Berwick, Maine and resided there for the rest of his life." "It was proposed in 1934 that a Buffum family organization be formed with the primary objet of acquiring the old homestead at North Berwick, of preserving it as one of the few typical colonial farmhouses left in New England and of using it as a place to which the family may go . . ."
143 "John joined the Quakers in 1660, Deane says, but probably a little earlier, for John was baptized in 1657, by Mr. Witherell, while Thomas born in 1659, and Rhoda born in 1661 or 1662, were baptized on the account of their mother, Rhoda, who had evidently continued to adhere to Mr. Witherell's church. "The Friends' records commence in 1680, but a large number of births, which occured before that date, were entered; among them all the children of John, except John and Rhoda.